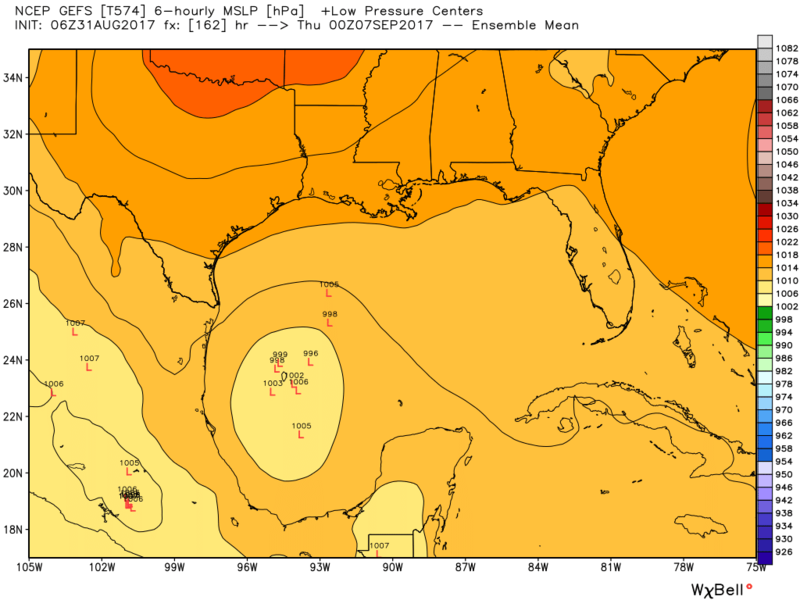 One of the reasons we don’t think that tropical low will threaten Texas is because confidence is growing that the first fall cool front will make it through Houston next week. While this isn’t a certainty, global models are consistently showing the front making it through around Wednesday or Thursday. I’d rate the probability of the front making in at about 80 percent, and that should lead to a few nights in the low 60s. Goodness knows, we’ve earned an early fall front this year. As most of you know, Irma has formed in the deep Atlantic tropics, and it will soon become a hurricane. This seems likely to become a major hurricane as it moves westward across the Atlantic Ocean, but it’s not clear where the system will go. It is five or six days away from even reaching the Caribbean Sea, or skirting to the northwest. It is beyond the range of models to forecast storm movements beyond 7 or 8 days, so we can’t know where it’s ultimately going to go. Certainly the United States should be paying attention to this threat. That said, the odds of the storm plowing continually westward and ultimately reaching Texas are low. So while we’re watching, we’re not too concerned for our city. And neither should you be. Good morning, Eric! We want to add our sincerest thanks for all your efforts to inform us while living through the days of storms, floods and disasters with your family. Your website is our Go To weather site and we send it out to all we can. We are near the San Jacinto river and Hy 59. We personally are not flooded but many friends and businesses are. It will take a very long time to recover from this in our area also. We appreciate all Matt and your work. The big problem is not having internet/power to read the latest updates from you! No answer to that yet. Eric and Matt I want to again add many, many thanks for your clear, calm reporting during the storm and what were your own personal crises. 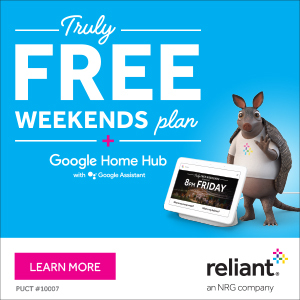 You are an example of what makes Houston such a great place to live – our people! My daughter and I have strong differences on the topic of global warming. My opinion is no such thing and her opinion is that it’s a very real threat. One question, what is your opinion on the topic of global warming. The other question is, are there common sense and no pushing a propaganda books for the laymen to understand the pros and cons on global warming. My few years of Geology in college (a science I really enjoyed) tell me global warming is a hoax and a propaganda movement. Just trying to make common sense out of what is pressed as a global urgency. Big difference between taking a few courses in college that may only scratch the surface, and practicing the science as a career. My challenge to you would be to understand and refute what 90+% of scientists stand behind, then see which/who is the outlier. Good luck to all of you down in Texas – we are praying for you up here in the Pacific Northwest! J.L., I’d say if you can make ‘common sense’ or any other kind of ‘sense’ out of even the masses of ‘scientific’ data and theoretical speculations about ‘global warming’ / ‘climate change’, never mind the political / ideological fireworks, you will deserve the Nobel Prize! Unbiased books for the layman? Good luck! One thing you can be sure of: when you are told to ‘shut up and trust the experts’ to tell you what to believe, you should do exactly the opposite! Sure, don’t blindly “shut up and trust the experts”, but by the same token don’t delude yourself that the picture you’ve cobbled together yourself from bits of data, anecdote, and gut-level understanding of the world are in any way equal to the professional opinion of a subject matter expert, much less the majority of the global scientific community. There was a time when the existence of climate change was a question big enough that doubters could loiter comfortably in its shade. That time has passed, and those still seeking shelter in denial are simply telling the world that the rain is just someone urinating on their leg, to invert the phrase. This Michigan grandma is grateful for your forecast.. you have calmed my concerns for my League City family. Bless you, your team and fellow Texans. An additional thank you for being the best weather site in the history of EVER. I just want to thank you and say how glad I am to have found a voice of reason during this mess. I don’t see TV except via laptop and had grown so sick of the efforts to dramatize an already dangerous and tragic situation. I kept looking for a site that just calmly explained what was happening and what we could expect further down the line. I so much hope that both of you were not flooded, and I thank you for the work you do. Shoutout to Hope! I love this hype-free, calm, fact-based reporting that you all have graciously provided. Thank you for being my and many other people’s lifelines during the past week. Such a happy post makes me want to cry in relief. Thank you for not only bringing us the bad news when we had it, but also bringing us the good news when we need it as well. Eric and Matt — You all have been our sanity throughout this storm. Thank you for your concise, level-headed and smart reporting. I feel so much more confident about what is going on when I read your reports. Thank you for staying up nights and getting us through this storm. You guys rock so hard. Thanks for all your amazing work during Harvey and all year. A huge thanks to all of you from Spacecityweather. I live in Oregon but our daughter just moved to Galveston to attend UTMB 3 weeks ago. Classes were to start last Monday. That certainly did NOT happen!! As the storm spun endlessly in the region dumping these record breaking rainfalls I so looked forward to your next post. The television was too much hype and while it was a very life threatening situation I needed a “calmer” voice in the storm. My daughter is fine. She actually went to Friendswood to stay with a family friend (a bit scared to spend her first hurricane alone) for one night last Friday as the storm made landfall but then Saturday decided to go back to the island. That turned out to be a great decision. As you know Galveston did not get the rain amounts that Houston did. Our family friend was not evacuated but she was trapped in the house by water for 5 days. Our daughters apt is in an old house raised on stilts, she had a “river” 3-4ft deep for a day in her street but it receded quickly. I can’t thank you enough for your style of reporting . It’s accurate and insightful. When you’re separated from family it’s such a helpless feeling to watch the TV and know you can’t do anything to keep your daughter safe. I’m so glad your blog exists. Keep up your good work. Hey guys, I have a question. Since Harvey has churned up and agitated the Gulf waters, has the water temperature decreased? If so, will this lessen the likelihood of further development for the remainder of the season (essentially the end of September)? Thanks for all you do, I consider you guys heroes in Houston! 1. Are you sure about this cold front deflecting the Bay of Campeche low away from Houston, Eric? NWS Houston isn’t mentioning it in its discussions. 2. Wouldn’t Harvey have brought up enough cool water to the surface to prevent yet another devastating TC from battering Houston? Surely he would have. 3. Even if there is development, surely whatever does spin up would not be as catastrophic as Harvey. Even if it did develop and go into SE TX, it surely wouldn’t be the catastrophe that Harvey was, Eric. Surely. No, it would be different. All storms are different. My great concern with Irma, wherever it makes landfall, would be wind and storm surge. I appreciate the straightforward reporting of your site and it has helped ease fears and concerns, so – thank you!! My question is about the environmental impact of Harvey. Should we have any concerns about the air quality, pollution issues or water quality either now or in the future? I’ve been sifting through governmental sites, but being a non scientific person myself, it gets confusing sometimes! Thank you again for everything. We will have our annual fundraiser toward the end of the year. But this certainly isn’t the time for that. We sure don’t need more rain. I hope that the weather will stay hot and sunny, I would love 105 and dry heat for the next several weeks. I may move to the desert. Definitely considering moving after this. And, for all the jokes about evacuating Katy, that is exactly what happened when they released the dam. Is the new wave off of Africa that the NHC shows the developed storm that is showing up after Irma on the recent GFS run? Just put up a new post on tropics threats. Eric, Matt, and Braniff – I will echo the words of many others and say thank you for your level-headed coverage over the past week. Your reporting and analysis were, along with the NWS and HCFCD, the primary tools our family used to make decisions about whether to go or stay, whether to worry or not, and how to cope with what was happening around us. You certainly saved many from insanity this week, and I have to believe you saved a life or two in the process. Please keep us informed about how we can support your work. Sure, David. We will have our annual fundraiser toward the end of the year. But this certainly isn’t the time for that. 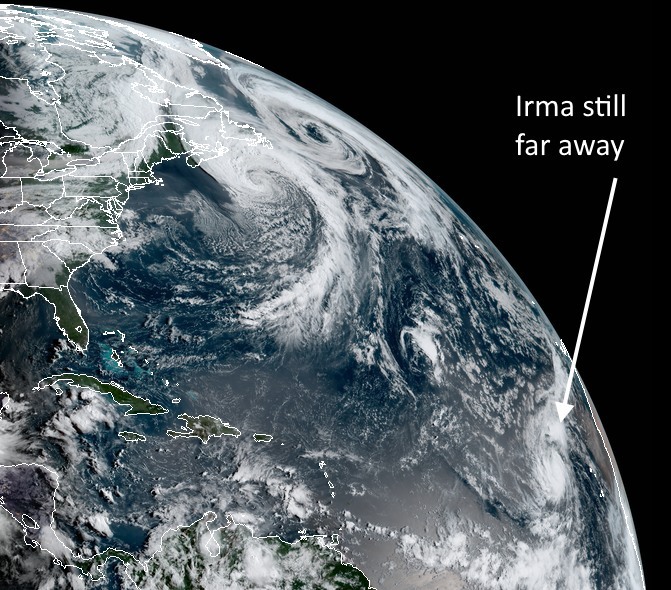 Are two other hurricanes up in the North Atlantic in that satellite image? I know they can’t come down this way; I’m just very interested. Eric, you guys are the best. Thru the years, have come to rely on your pure weather. Thank you.